Make our delicious wood-fired pizzas the centerpiece of your next party, company picnic, wedding reception, or get together. Firing pizzas in our outdoor high-temperature brick oven is fun to watch—and the ’zas turn out incredible. That’s because we’re cooking the pizzas the way they were intended to be cooked: quickly, at temperatures of 800°F – 900°F, in a wood-fired oven, using freshly made dough using organic flour. At these temperatures, the pizzas cook in just minutes, meaning we can feed large groups of people quickly . . . perfect for whatever event you’re planning. What’s the secret to great pizza? 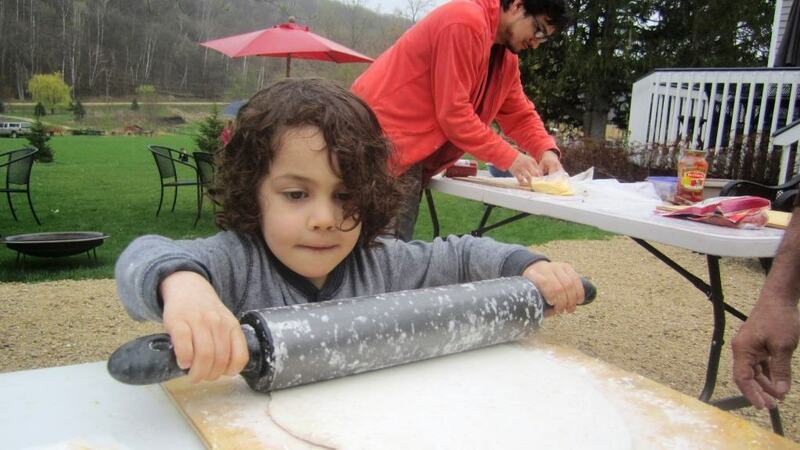 Fresh dough, fresh ingredients, and a really hot brick oven. A little fresh air and good company don’t hurt, either! When Steve (or “the pizza ninja,” as he’s known in these parts) fires up the outdoor brick oven next to our event patio, the bricks get hot—really hot, as in 500°-700°. At those temperatures, the pizzas cook very quickly…generally, between 3-5 minutes. The bottom crust cooks quickly, giving it a pleasing charred flavor on the edges that makes it taste just a little smoky, but in a good way. And the cheeses and toppings retain their freshness instead of being dried to a crisp, as can be the case in a slower cooking oven. When these textures and flavors come together, the flavor is something like true love. Of course, every pie is better with a glass of your favorite beverage and accompanied by friends, family or happy people. Our homemade wood-fired pizzas are a great idea for any outdoor event! Contact Steve about pizza orders and pricing. Allow 2-3 hours for the wood-fired experience.